Originally equipped with electric motors, these coaches were among the finest Multiple-Unit cars ever built, providing outstanding commuter service in New Jersey for 54 years, and Museum Railway service today. These low-roof 84-passenger closed-end commuter cars of copper-bearing steel are 70′ 1 1/2″ long and 13′ 6 1/2″ high, and have composite floors, rollover seats, spherical-globe light-fixtures, and four-wheel trucks. They originally weighed 148,200 lbs. (74.1 tons), had four fans near the ceiling, and window shades. Round-edge aluminum parts helped to avoid injuries and reduce rust. Each car had four GE 1,500-volt DC motors with collapsible pantographs to a 3,000-volt overhead catenary 24′ above the rails; top speed of 70 mph; and rooftop connections to a trailer car at one end, with motorman’s controls and Pyle headlight at the other. They were among 141 Pullman green motor cars built for Delaware, Lackawanna, & Western Railroad’s electrified Morris and Essex division in northern New Jersey, and were numbered DLW #2581, 2583, 2584, 2585, and 2586. Beginning September 3, 1930 these cars worked the 70 miles from Hoboken to Montclair, Gladstone, and Dover (via Summit) in a 54-year service of legendary reliability. On October 17, 1960 the bankrupt Lackawanna & Erie Railroads merged to form Erie-Lackawanna, and the cars were renumbered EL #3581, 3583, 3584, 3585, & 3586. “Erie” was added to their letterboards to the left of “Lackawanna”, giving them unbalanced looks. The EL became part of Conrail April 1, 1976. On December 10, 1979, state-owned New Jersey Transit became owner of the commuter lines, although Conrail continued operating the trains. Vinyl seats replaced the rattan ones; #3583 was repainted green and #3581 and #3586 were painted red with white trim but were not lettered. The other two cars weren’t repainted, retaining EL lettering. Maintenance cutbacks and impending retirement caused the cars to become dilapidated. On August 24, 1984 NJT changed to an AC-current system and the DC cars were replaced by “Jersey Arrow” ones, and stored at Mahwah, NJ, where many parts were stolen from them. In January 1985 the five motor cars and a trailer car were purchased by the PSRMA for $2,000 each for use as coaches on its excursion trains. Their age, sturdy construction, openable windows, and rollover seats made them ideal for this vintage service. Leaving Mahwah March 12, 1985, they were taken free of charge 3,536 miles by Conrail, Missouri-Pacific, Union Pacific, and Santa Fe, arriving in San Diego May 29th, delayed enroute by mechanical problems & vandalism. Museum workers removed pantographs and other equipment not needed for their museum service at the San Diego Trolley yard. In June 1986 #3581 and #3586 were trucked to Campo; #3583 and #3585 came up on “Great Freight II” February 28, 1987; and #3584 (flat spots on its wheels repaired) on “Great Freight II 1/2” in March 1987. 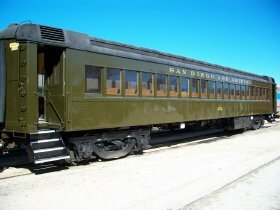 Their motors were removed; windows, frames, and seats removed, repaired, and replaced; roofing, brakes, and mechanical parts serviced; and the cars painted Pullman green with gold lettering and cream interiors. Because the last coach on a 1927 “original” SD&A car roster was #249, these converted cars were renumbered SDA #250(ex-3586), #251(ex-3583), #252(ex-3581), #253(ex-3585), and #254(ex-3584). SDA #250 was installed by the museum in its new SD&A Railway service in July 1986, and the others in 1987-88. In 1987 some were used in filming A Time of Destiny, with William Hurt.